The Bender Bunch: Watermelon Experiment or NOT? Well I was hoping to add this science experiment to my ultimate "Science for a Year Kit," but it was a major fail! The idea is that the pressure from the rubber bands is supposed to crack and split the watermelon! Well it didn't happen! We put almost 200 rubber bands on and nothing! I know it is possible though because my good friend, Kayla over at "My Special Learners" did it at summer camp and it worked! She suggested purchasing the largest rubber bands. We purchased the largest ones Walmart had, but obviously you need even larger ones!!! 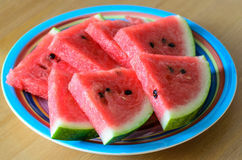 On the upside, we enjoyed some good tasting watermelon instead!!! If you try this experiment, I'd love to hear how it works for you!! Hate when an experiment doesn't work like you planned!! It can lead to the best conversations with students, though! Thanks for sharing... Glad to know it doesn't just happen in my classroom!! Never Lose Another USB Drive Again & Giveaway!! !